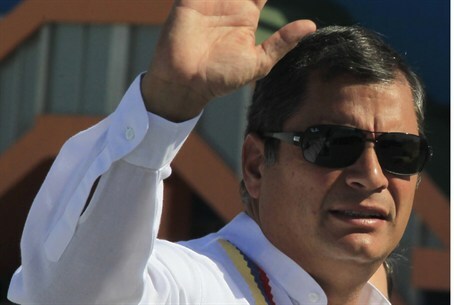 Ecuadoran President Rafael Correa: We'll consider giving asylum to anyone who requests it, including Syria's Assad. Ecuadoran President Rafael Correa said on Monday his country would consider granting asylum to his embattled Syrian counterpart Bashar al-Assad, AFP reported. "Any person that requests asylum in Ecuador, obviously we are going to consider as a human being whose basic rights we have to respect," Correa told the daily Folha de Sao Paulo in an interview published Monday. He confirmed that Syrian Deputy Foreign Minister Fayssal Mekdad visited Quito two weeks ago but denied recent reports in the Israeli media that a possible asylum for Assad and his family was discussed during the visit. "These conversations did not take place," he said in the interview, according to the AFP report. Correa said Mekdad came to Quito to thank Ecuador for its "objective stance" on the Syrian civil war. "Ecuador will never favor violence...Can we believe all those news stories on violence, the dictator? Let's remember what was said about Iraq," he added. Last week, Ecuadoran Foreign Minister Ricardo Patino denied that Assad had been offered asylum, reported AFP. "Totally denied," Patino said on his Twitter account. "No Syrian citizen has requested asylum in Ecuador, much less its current president." Assad has so far rebuffed international pressure to step down, but fighting has intensified around Damascus amid a brutal civil war that human rights monitors estimate has claimed at least 42,000 lives. On Sunday, radical Islamist rebels seized large swathes of a Syrian military base west of Aleppo, as they consolidated their control over territory in the north near the Turkish border. The report of the takeover came hours after the regime of President Bashar al-Assad said that Syrian rebels had gained control of a toxic chlorine factory east of Aleppo. However, the spokesman who issued the statement was sacked within hours for making statements that “did not reflect government policy,” according to Beirut-based Al-Manar TV, linked to Iran-backed Hizbullah terrorists.